One of my very favorite things to make with my Silhouette is a onesie. It’s just automatically cute…and can only get cuter! I’ve made several as gifts along the way (including this one for a friend and this one for my daughter’s first birthday) but I decided I’d share a few more with you today…because they’re just so darn cute! Our dear friends Robbie and Kate are getting ready to welcome their first little girl into the world. I thought that they’d have the baby – and these gifts – in hand before this post went live…but little baby Eleanor is a stubborn one and still staying put (for now)! 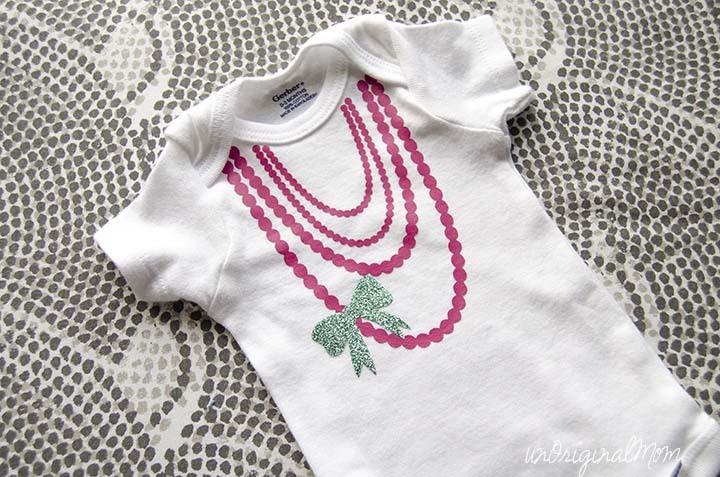 So happy early birthday, Miss Eleanor – you’ll be getting these lovely onesies soon! 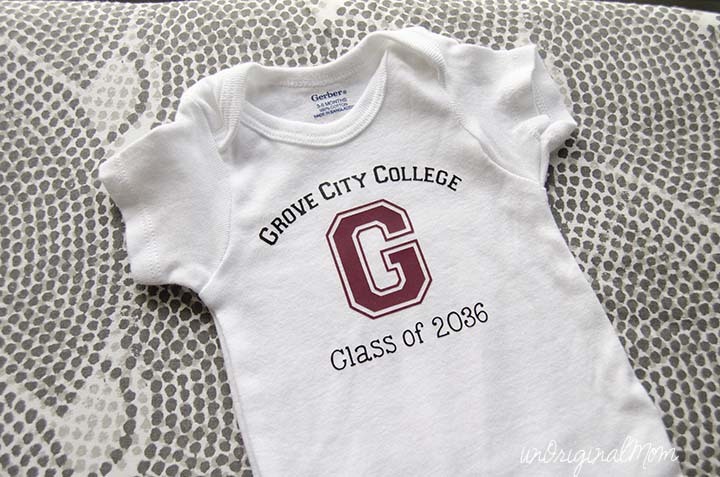 Both Robbie and Kate are Grove City College grads, so I couldn’t resist the school spirit onesie, made with smooth heat transfer vinyl. It was kind of scary to count up the years and figure out this little one’s college graduation year – gosh, we will be so old by then! This Penn State onesie is for another friend having a baby this fall. 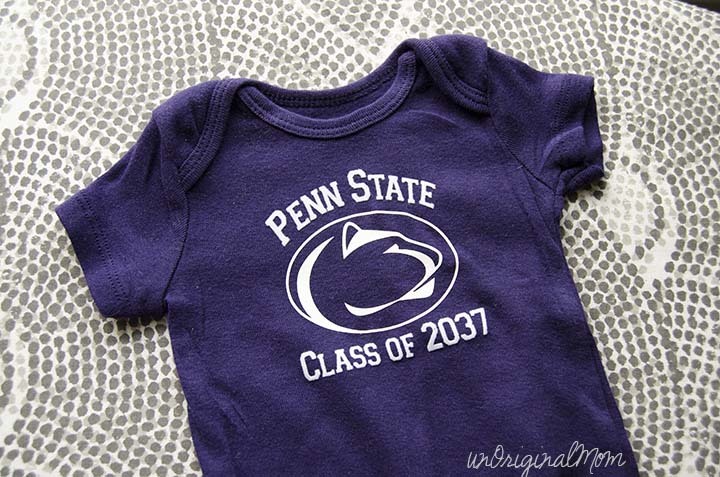 I stocked up on navy blue onesies when they were on clearance at Michaels, so Penn State friends, you can expect one of these from me for all of your future babies! The PSU logo is regular white heat transfer vinyl, but the text is flocked white heat transfer vinyl. I love the texture that it adds – it works so well on plain text like this! Since this is their first girl (they have a 13 month old boy), I had to make a few glamorous girly onesies. This adorable necklace cut file is a freebie from Crafty Jac (which I discovered from this wonderful onesie round-up over at The Thinking Closest!). I used pink heat transfer vinyl for the necklace, but glitzed it up a bit with glitter heat transfer vinyl for the bow. Who doesn’t love some sparkle? Speaking of sparkle…I got the Rhinestone Starter Kit in the mail last week! I was so excited to try it out. Let’s just say, it’s not for the faint of heart (or the impatient), but the result is worth the tedious process. 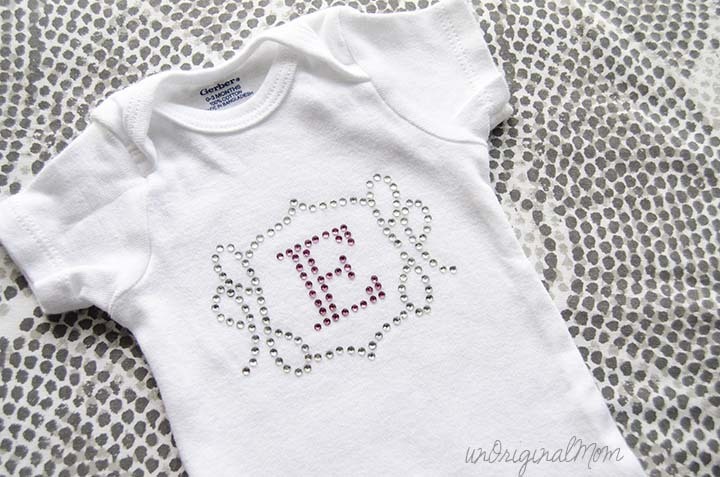 I used my Designer Edition software to make a rhinestone template out of a monogram (design #60060 from the Silhouette Store) and ironed it onto a onesie. So girly and glamorous! I just love how it turned out. You can see a detailed step-by-step tutorial on how I made this rhinestone onesie here. Whether or not you have babies in YOUR future, I bet you know someone that does…and homemade onesies make such great gifts! 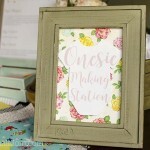 In fact, you could make a couple of onesies along with a Baby Shower Folder and give the most personal, practical, and fun gifts that momma-to-be will get! Are you a Silhouette lover? Or perhaps you’ve had a Silhouette on your wish list for a while now? 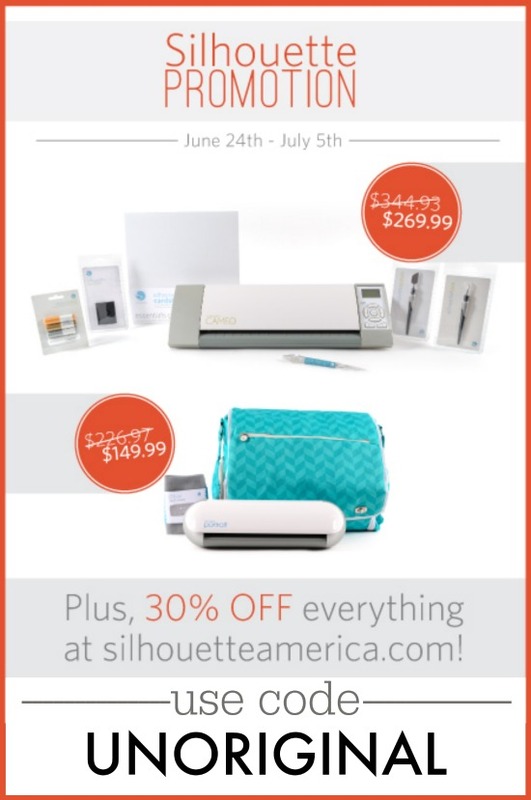 Silhouette is running a great promotion from now until July 5th…machine bundles at a great price, and 30% off EVERYTHING! 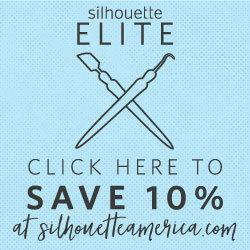 That’s right, 30% off any supplies you need at SilhouetteAmerica.com. Time to stock up on blades, mats, specialty media, vinyl…anything on your list that you need to replenish or add to your stock! Remember to use the code “UNORIGINAL” at checkout to get these great prices. I’m always looking for new inspiration…what’s the cutest onesie you’ve ever seen – or made? Leave a comment, I’d love to hear about it! These onesies are all adorable! 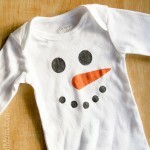 I need to start stocking up on blank onesies for shower gifts. 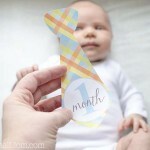 They are so fun to make for shower gifts! I have a stash of pre-washed onesies left over from a shower I hosted a few months ago, and it’s been great to just grab a couple to whip up as gifts whenever I need. What would you charge me to make a PSU onsie that has the logo and then text that says My 1st White Out? The pearl necklace file is a cut file from another blogger, I linked to it in the post above, so you should be able to download it from her site directly. How does the heat transfer vinyl stand up to the washing machine? Hi Lauren, it does pretty well if you do it right! The key is to prewash your garment before you apply the HTV, and take your time applying it with lots of heat and pressure, even ironing it inside out. Then once it’s applied, always wash/dry it inside out. I probably washed my daughter’s first birthday onesie at least a dozen times and it held up great! Love these, so darling! Thanks for sharing. I’ve been looking at a silhouette for awhile. I was excited to use your code, but when I tried it today it said “this item is currently unavailable.” Any ideas? I wanted to buy through your blog instead of amazon or overstock.com. Hi Jessica, thanks so much for wanting to support my blog – I SO appreciate it! I checked with Silhouette and it is a glitch in the system somehow, they are working on resolving it…I will let you know once they tell me it’s fixed! The promo bundles should still be good until July 5, once they fix the issue with the website. I will be in touch once I hear back that it’s fixed!! I tried it on another computer and it worked! SO loving the cuteness over here! And these are extra special to me because I’m a Grove City grad and my sister is a Penn State grad! LOVE! Also, your post could not have come at a more perfect time. I wanted to make a shirt with my Silhouette and the HTV, but the tank top I was going to use is somewhat stretchy (kind of like onesies, but maybe a smidge stretchier). How does that work with HTV? Is it so well bonded that it will stretch with it? Or should I choose another material that wouldn’t stretch as much? Thanks so much for your help, Meredith! Hope you’re having a great week! Thanks Abby, so glad you like them! (I made them for the daughter of our mutual friend and Grove City grad Robbie H!) I’ve never tried using HTV on ribbed tank tops before, but some folks in our facebook group have had trouble with it not adhering well or stretching too much after being worn…I think the solution that they’ve come up with is to use a freezer paper stencil and fabric paint on ribbed material like that. HTV on onesies holds up really well, though…the one I made for my daughter’s first birthday went through at least a dozen washes/dries and I never had a problem! I love the extra touch of glitter for the bow on the necklace onesie! Adorable! These are so adorable! Adding these to my list of reasons to get a Silhouette. I’d be thrilled if you’d link up at this week’s Off the Hook! These are PRESH, Meredith! Thank you bunches for linking up and partying with us this week! Hello! I am thinking about getting a Silhouette for my bday. I was looking through Pinterest at Silhouette ideas and came across this post. 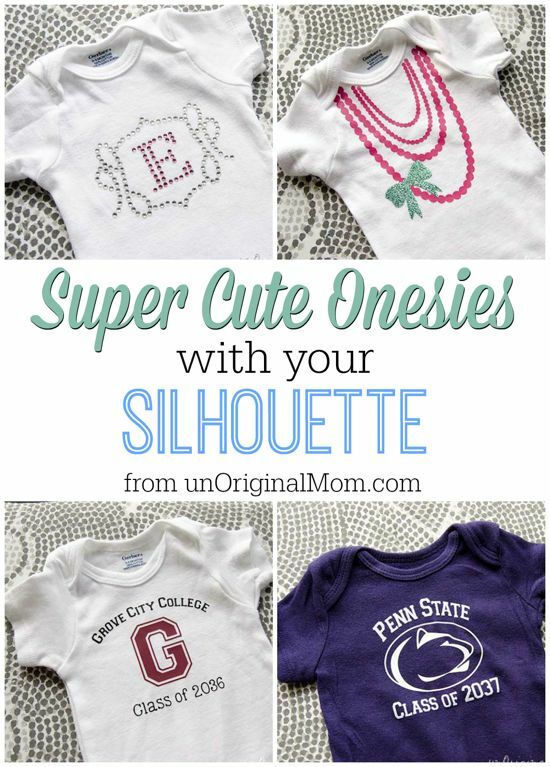 These onesies are *adorable*, plus the pin caught my eye b/c I’m a PSU grad ;-) I was just wondering if you would be willing to share how you cut out the Nittany Lion? Thank you in advance! Hi! My mum bought a silouette and is now expirementing and looks to her daugter to give her new ideas, so I found the onsie with the necklace and like it a lot, my best friend just had a girl so I would really like my mum to make one like that, but I can’t find the stencil in the silouette store for nulmer 60060 … could you please help me ??? Omg I just came across this post and I want one of those PSU onesies?? Any chance you’d consider selling them on Etsy?? ?